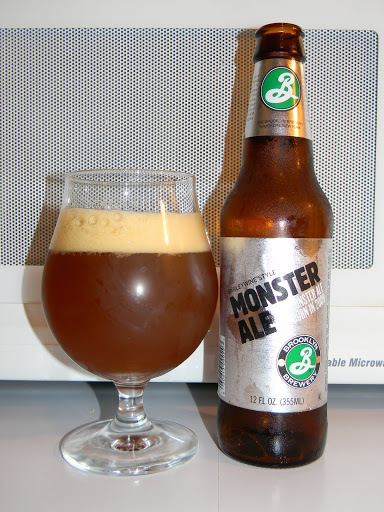 Review of Brooklyn Monster Ale 2009 | Beer Apprentice - Craft Beer News, Reviews, Interviews and Info. Today’s craft beer review comes from the Brooklyn Brewery in Brooklyn, New York. It’s called the 2009 Monster Ale. I’ve never had it. I’ve seen it on the shelves a thousand times, but have never picked it up for some reason. Well, I have it in my possession now so……. The website, brooklynbrewery.com, had this to say about the Barleywine. Available from December through March. Brooklyn Monster Ale is a classic barely wine, a style of ale originally brewed by the butlers to the English and American aristocracy. It is brewed from three mashes of heirloom British malt and spiced with aromatic American Willamette, Cascade and Fuggle hops. After four months of aging, it has a magnificent burnished copper color, an aroma redolent of sherry, citrusy hops and fruit, a soft warming, complex palate, a spirituous finish, and a strength of 10.8%. It is vivacious when young, but will age gracefully for many years, becoming more complex over time. This beer has an ABV of 10.8% and comes in a 12 oz. bottle. The appearance of the Monster Ale was a mix of amber, copper and brown colors. An off white to beige colored head was formed that showed both large and small bubbles. It was just a tad soapy looking, but after several swirls it became smooth and creamy. The retention was only average, however it left behind some nice, patchy lacing on the glass. It also had a decent set of “alcohol feet” sliding down the snifter. The overall appearance was clear with no sediment floating around. The nose had representations of some booze dipped cherries. Somewhat of a citrusy note like tangerines or something seemed to hide in the background. A nice bready malt along with a soft toffee and caramel sweetness. The alcohol was most definitely present, however I didn’t find it to be out of place or distracting to tell the truth. The aroma was balanced pretty well I thought. The taste was rich and more intense with the malt. I, personally, liked that. Again, more cherries and dark fruit (plums). It continued with the sweetness by providing more of the caramel and toffee malts. A pronounced baked bread flavor was in there also. The alcohol tones started strong, but settled in wonderfully as it warmed to add to the overall balanced and even taste. The mouthfeel was medium to full, chewy, smooth, slick and very dry. Bountiful amounts of flavor were left behind too!!! The mouthfeel started warm then finished with a wonderful burn that hung around for several moments. This is another awesome beer from Brooklyn. It really develops and becomes quite enjoyable as it warms. Very rich, intense and robust malts along with the booze soaked dark fruits really help this beer fall in line nicely with the Barleywine style. The high ABV of this beer would not allow for high drinkability, but seemingly styled more toward a nightly “sipper.” Barleywines are starting to become a favorite style of mine. I have only really been interested in them for about the past year, however I have really started to take a liking to them. If you favor these beers, pick up a Monster Ale this Winter and experience all it has to offer. I would love to find a few other vintage years and see how this brew mellows over time. What’s the “best” Barleywine on the market today? Which do you guys prefer?